Military Jacket, a new fashion must-have? Earlier today i was browsing through some of my old fashion magazines, and i came across this image. An Image of a Balmain Military Jacket. I love them, and i think military is slowly creeping back into fashion. Cheryl Cole starts us off with wearing a military jacket in her video for her first solo single, Fight for this love. Following by her appearances on x-factor and on Children in Need wearing military. On her first performance as a solo artist on X-factor sporting the military style very well. But my all time favourite military jackets have to be the Balmain and the Balmain inspired jackets! Love all those jackets!! Cheryl looks great in her outfit!! I'm noticing the 80's padded shoulders coming back in too, especially on military jackets. Yes, a must must have, just got one! I will have to dig mine out of the wardrobe! I haven't worn it yet! maybe it's not exactly a "new" trend since it was seen from the summer catwalk but it is with no doubt a chic cloth! Defo military jackets are back - love the 80's twist. Cheryl looks good as always, love the white one she wears in her music video too. love them all, and recently bought a copy of the last one.. can't wait to wear it!! I love military jackets and am dying to get my hands on one. Oh I LOVE these. They're real statement makers, aren't they? And yet are still able to incorprotate into practically any wardrobe. I think military jacket is a must have!!! 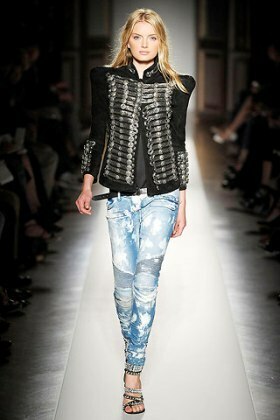 woaaa I love Balmain and this military jacket is the top of the jackets!! im not so sure. i think the trend is already over. I guess that more than a new fashion must have is how you pull it off. I feel that this trend is going to be hit on so much so it's all about creativity. New colors and maybe bolder designs and textures on the jackets. lekisskiss.blogspot.com <-- our site just got a makeover! check it out! I love that jacket! Especially the blue version! love your blog so think I'll add you to my blog roll. I like these jackets. They make for a great look! Balmain and MJ really brought these back - great details! I love love love the last pictures of the military jackets. Thanks so much for stopping by my blog! Awesome blog!I really like these Jackets! I think swapping links would be a fabulous idea! Rhianna looks killer in that jacket she works military well! The Balmain jackets are amazing! love it love it love it, rihanna looks hot in it! Decarnin started something huge with that Balmain collection!! everything returns.. Michael Jackson wore them years ago and now they have come back to be a must!! LOVE MILITARY JACKETS! Love this outfits a lot. I love military jackets, and they always seem to be coming back in! I wasn't too sure about the Balmain shoulders at first, but now I can see how amazing they are! 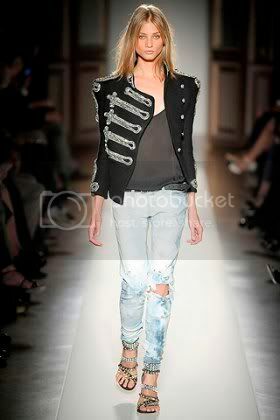 Love the jackets, and mostly the one from Balmain.. My favorite designer.. Nice blog :-) and greetings from Denmark..